Arriving at a fair and equitable price for corn silage is difficult due to the number of factors involved that are dynamic and biologically variable. Grain equivalents are quite variable to the extent that one predetermined value should not be used in contracts between growers and dairymen. Understanding the relationship between corn grain and forage yield is important to dairymen and grain farmers who often contract with each other for corn silage production. Recently, the grain versus forage relationship has been used to set government Loan Deficiency Payments (LDP) to farmers for corn silage acres. Arriving at a fair and equitable price for corn silage is difficult due to the number of factors involved that are dynamic and biologically variable. Some growers will want to calculate the forage price based on corn grain yield (as the alternative harvestable crop) and some dairymen will want to calculate the price based on alternative forages (primarily alfalfa as the alternative forage source). In either case, the final price is affected by supply and demand of corn grain within a region. The objective of this paper is to describe the relationship between grain and forage yield. For the growing seasons between 1997 and 2005, experiments were conducted to measure the impact of hybrid, plant density, planting date and row spacing on corn performance. It is difficult to obtain data for both corn grain and forage yield as usually one or the other is harvested in a field or research plot situation. In these studies, forage yield and quality was measured in four of eight rows in the plot. The four remaining rows were left for later grain yield and quality measurements. 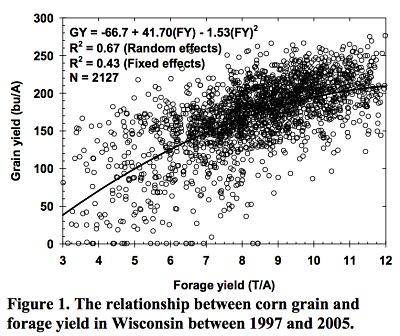 The relationship between grain yield and forage yield is shown in Figure 1. Little grain yield was measured when forage yields were below 2 to 3 tons dry matter per acre. The relationship between grain yield and forage yield was mostly linear through forage yields of 8 tons dry matter per acre. To calculate the value of an acre of corn silage, the amount of grain contained in one ton of silage (grain equivalent) is multiplied by the corn price and the forage yield. 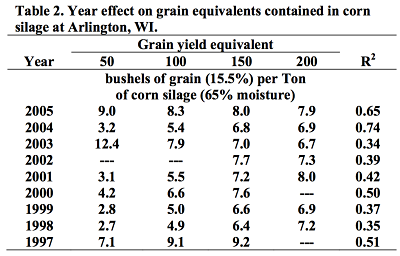 For example, if corn yielded 150 bushels/A and was 65% moisture, the grain equivalent is 7.5 bushels of grain per ton of corn silage (Table 1). An average yield is 20.4 T/A. If corn is priced at $2.00 per bushel, the value of the field is 7.5 bu/T x $2.00 /bu x 20.0 T/A = $300/A or $15 /T. Further negotiation would need to be conducted over harvest, ensiling, and storage costs. Anything that affects grain or forage yield will affect grain equivalents contained in corn forage. 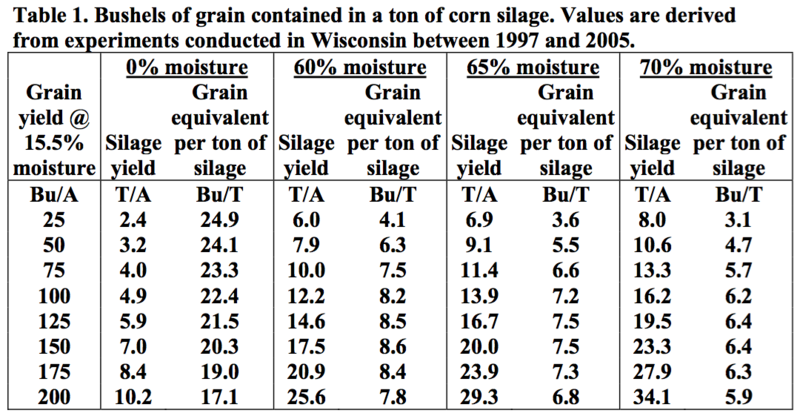 Depending upon grain yield level, grain equivalents per ton of corn silage ranged from 3.6 to 7.5 bushels per ton of silage at 65% moisture (Table 1). The amount of moisture has a major influence on this relationship and needs to be considered to accurately determine fair silage prices. Grain yield per ton of silage for four moisture levels is shown in Table 1. For a field that yields 150 bu/A, the grain equivalents range from 20.3 bu/T at 0% moisture to 6.4 bu/T at 70% moisture. Environment can significantly affect the amount of grain in corn silage. The 2006 drought affected pollination reducing both grain yield and plant stature. The drought from the previous year in 2005 reduced plant stature, but grain yields were at record levels. Following the 2005 growing season, farmers would sometimes talk about corn silage being ‘hot’ when fed to livestock, meaning that there was too much grain compared to stover (grain equivalents) in the silage. The growing environment affects the relationship between grain and forage yield. Depending upon year, grain equivalents ranged from 6.4 to 9.4 at a 150 bu/A yield level (Table 2 and 3). Due to the drought in 2005, many cornfields are shorter than normal but corn yield appears to be high. If this observation holds true and grain yield is relatively greater than forage yield, grain equivalents will be higher than normal. In 2004 and 2005, six corn hybrids were grown at six locations. Hybrid types included bmr, leafy, transgenic, and normal hybrids. Each hybrid was replicated 3 times and grown in 8-row plots, with 4 rows used for silage harvest, and 4 rows used later at grain harvest. On average, hybrids across locations and years produced grain equivalents of 7.5 bu/T (Table 3). The range among environment averages was 2.3 bu/T (min.= 6.3 bu/T, max.= 8.6 bu/T). The range among hybrids for grain equivalents was 6 bu/T (min.= 4.5 bu/T, max.= 10.5 bu/T). Grain equivalents tended to be higher at Arlington and Galesville in 2005 (drought early) than 2004 (normal). 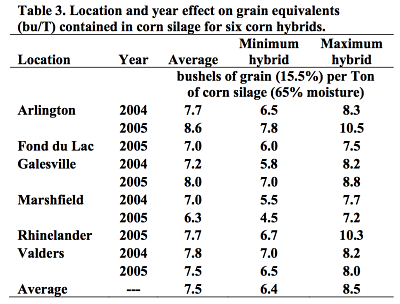 The average range among hybrids for an environment was 2.1 bu/T (max.= Rhinelander 2005= 3.6 bu/T, min.= Valders 2004= 1.2 bu/T). Brown mid-rib hybrids had significantly lower grain equivalents than Normal or Bt-ECB transgenic hybrids (Table 4). Forage moisture, hybrid and environment significantly affect grain equivalents and must be considered when negotiating a contract. Ideally, contracts should be based on corn silage quality rather than grain equivalents. Dairymen and corn farmers need to understand the grain equivalent relationship when acres are contracted for silage production. This relationship is dynamic and, as we are learning, quite variable to the extent that one predetermined value should probably not be used in contracts.